Standard Kit Includes noise reduction ring filters for coax, AC/DC power and 3 snap on filters for I/O cables covering RFI range of 1-300 MHz. Quick installation - immediate RFI/noise reduction. No radio mods required. The snap on beads are easy to use, don’t require modification of the protected equipment and work in almost all cases, even when plug-in filters fail. 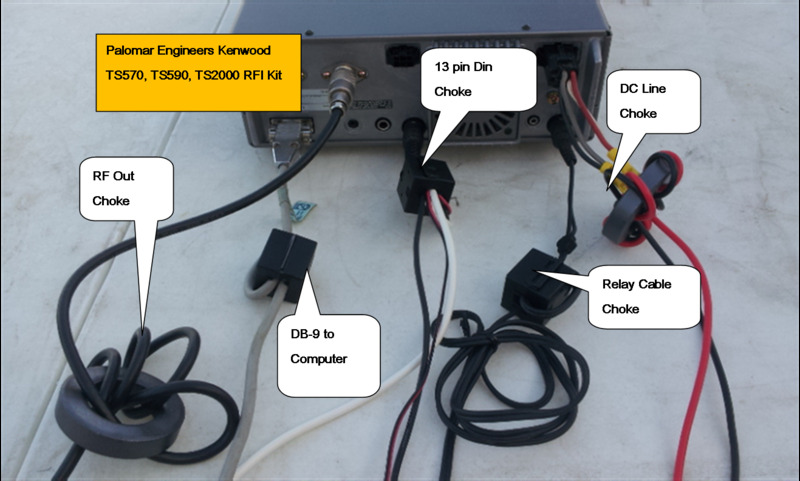 Use of the chokes often helps cure SWR problems between transceiver and a linear amp and between transceiver and antenna tuner or direct to antenna. The AC/DC power line choke helps keep common mode current out of the power line which could cause interference to other devices connected to the same power line if not suppressed. 3 additional I/O cables - 1/2" snap on with 1-2 turns through center. Multiple wires can share the same filter. For additional RFI suppression, use a feed line choke at the antenna feed point to suppress common current on the coax feed line.